At times angler crossed paths with Australian Salmon erupting on the surface in a feeding frenzy. Casting 3” gulp minnows casted into the commotion worked well. On the spoil grounds out from the sands caravan park anglers boated numerous pike and pinkies again soft plastics a fantastic tactic. Squid were still on offer over the grass beds in three to four meters of water with size three Yamashita jigs doing the trick. Bourke St is still the best location on the Bellarine Peninsular by far for King George Whiting. Fishing of an evening with some decent tidal flow is ideal with pippe and tenderised squid top baits. 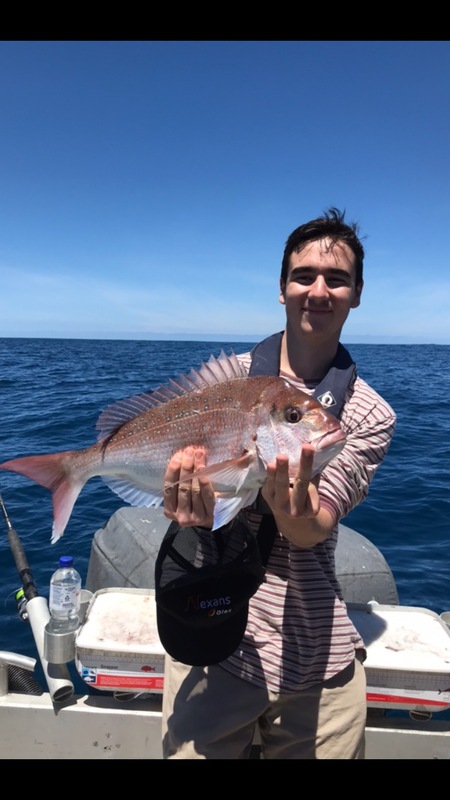 The channel inside Swan Bay is in fire during a run in tide for a mixed bag with some thumping big silver trevally to 50cm along with pinkie snapper of the same size. Fishing a fresh strip of squid at night will work well on the gummy shark with plenty of gummies to 8kg hanging around. The RIP is firing up for Kingfish with knife jigs working very well. Bell Reef and Queenscliff Pier have been very productive land based locations for squid here larger 3.5 size jigs work best. Off shore from Ocean Grove / Barwon Heads Kingfish are without question the most highly sort after species. Casting large 7” soft plastics into a school of surfacing feeding fish is a fast paced tactic that has produced results. 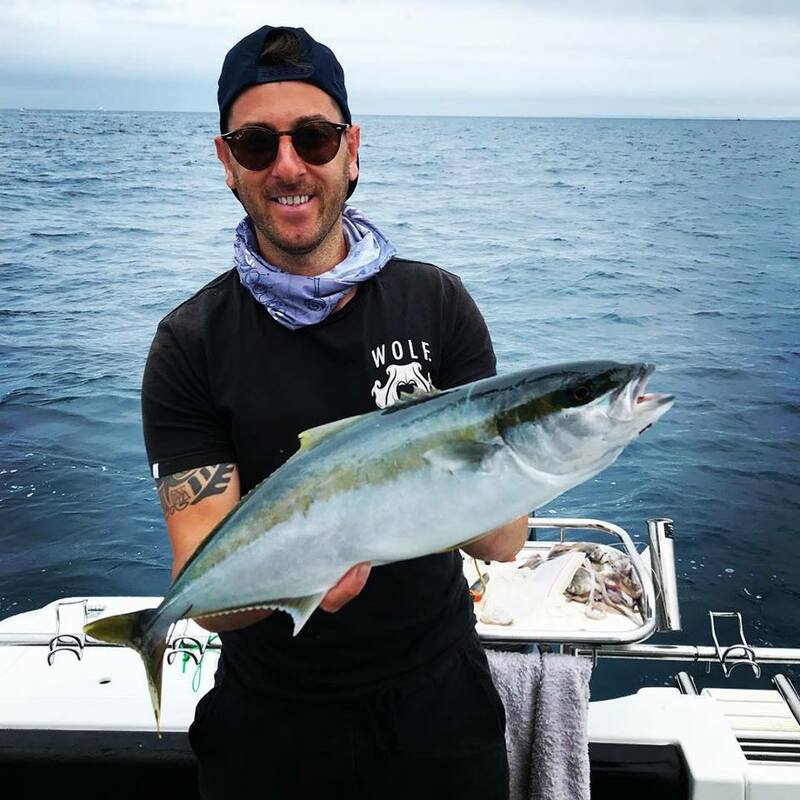 The most effective method has been trolling white ocky skirts with a fresh squid strip in 10 to 20 meters of water between Point Lonsdale and the mouth of the Barwon River. Working knife jigs over structure is also a great way to target Kingfish too. 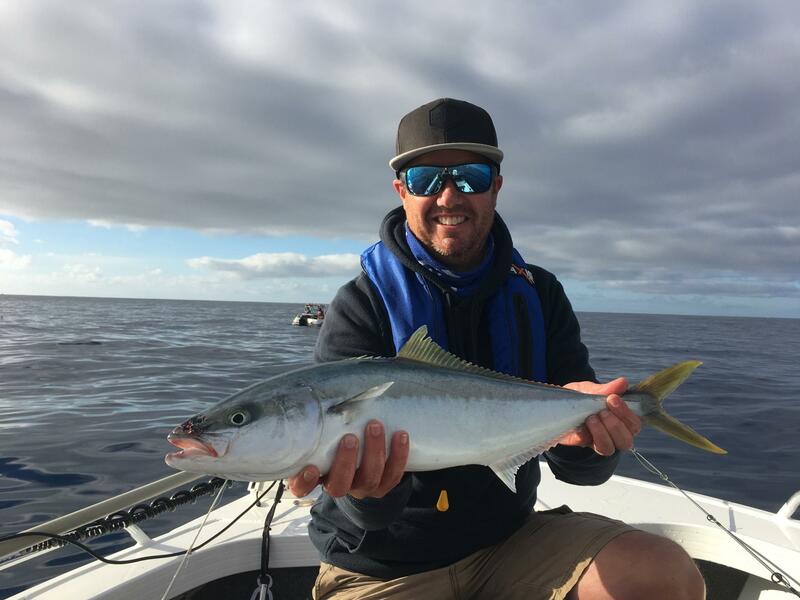 Fez landed a ripper Kingfish offshore last week! 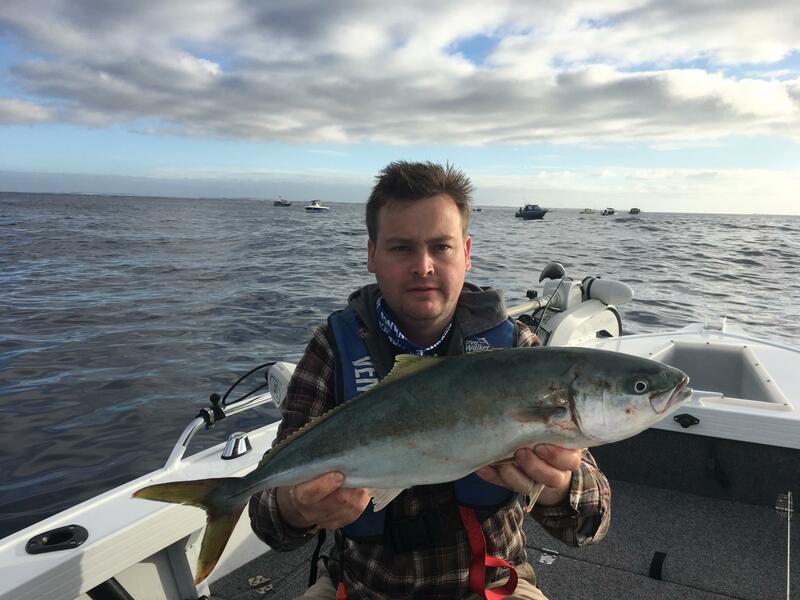 Trelly's Geelong's Chris and his mate Andrew also crossed path with plenty of kingfish. Using Gulp 7" Jerk Shads down deep did the trick. Chris from Gone Fishing Charter guided his clients onto snapper and Kingfish offshore last week. 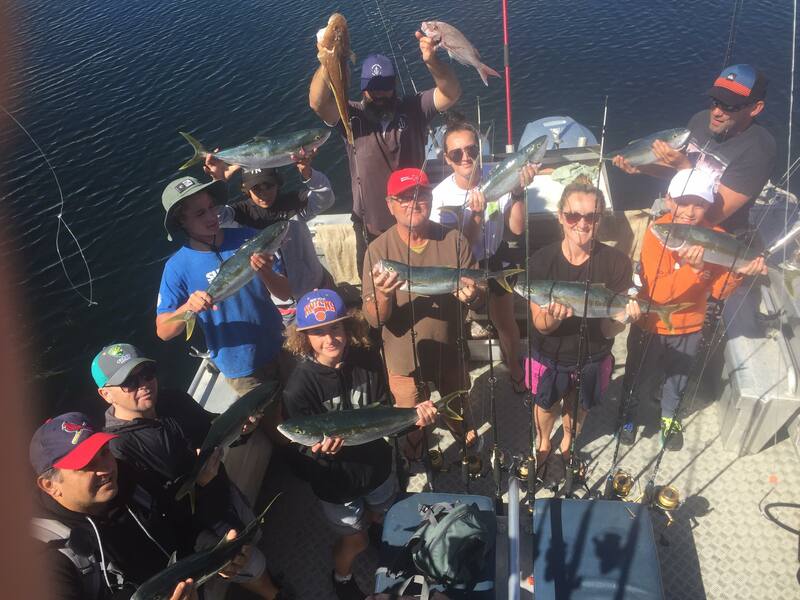 The guys at Ocean Grove Charters also made the most of the Kingfish action. Inside the river anglers fishing with live bass yabbies have encountered some big bream to over 40cm. Whiting and smaller model Australian Salmon have been common captures towards the front of the system. If its Southern Bluefin tuna your after then head to Port Fairy / Portland as the school tuna are in solid numbers. Trolling lures like a Samaki pacemaker 140D or a small 3” skirted lures will see you find fish to 30kg. 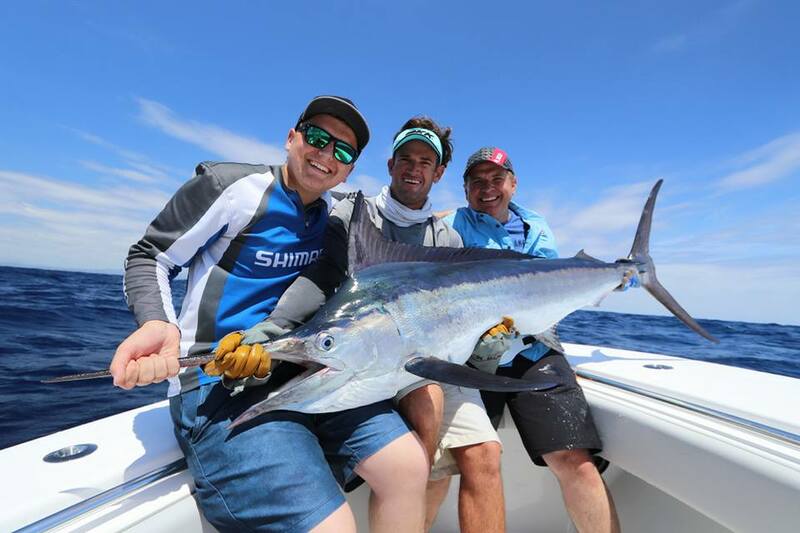 Trelly's Geelong Peri has been holidaying up on the Gold Coast this past week and chasing a few pelagic species. 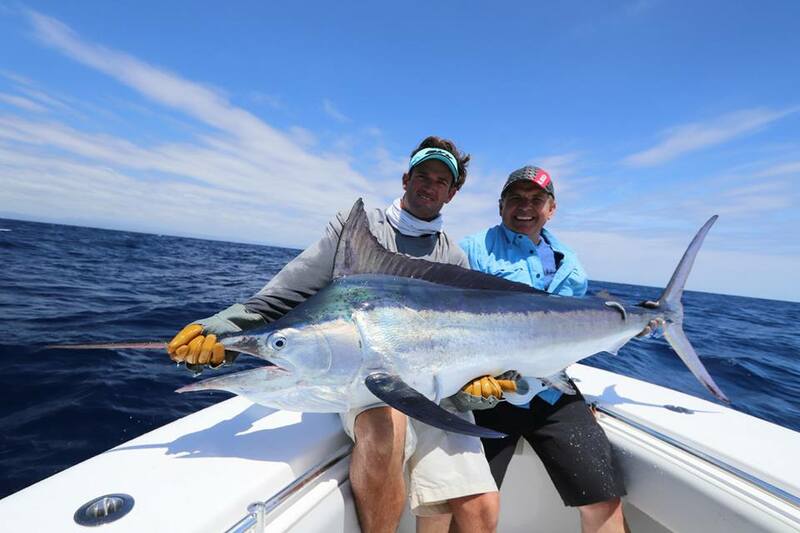 Peri boated two nice sized Black Marlin, his father Michael also captured two Black Marlin along with a thumping big Dolphin Fish. Still the place for a trophy brown trout either down rigging Tassie devils or fishing mudeye under a float along the east bank. Smaller model rainbow trout were taken by anglers casting lures around the weed banks at first or last light. The Goulburn River from Seymour to Nagambie looks really good, plenty of small Cod on a variety of Lures, trolling deep diving Hardbodies such as Size 1 Stumpjumpers, 85mm Codgers and Old Mate’s, casting Bassman Spinnerbaits, Codman Series in white or purple and the trusty old Bardi Grubs and Scrub Worms working well on the bait front. Most places are fishing well, land base around the Mitchellstown Bridge and the boating areas are from the Wineries and South past the Horse Studs, further north to the Nagambie Lake, Kirwans bridge area’s are fishing well, but watch out for the ski boat and jetski traffic, especially around the Island. The Boardwalk on Nagambie Lake is a great platform for a good chance of a Redfin or Yellowbelly, size 3 Stumjumpers and small Yabbies the best method. Murchison to Shepparton is fishing quite well, plenty of small Trout Cod, Silver Perch and Murray Cod on Worms, great fun for the kids with small size 6 Wide Mouth hooks, the lure fisho’s are starting to have some luck with bright coloured Codgers and Vibrating Blade Pirates in the Pink/White combo around Murchison, and Jackal Pomperdores and Bassman Spinnerbaits working well around Toolamba to Arcadia. Bardi Grubs and Scrubworms are working really well, but lots of small fish amongst them. 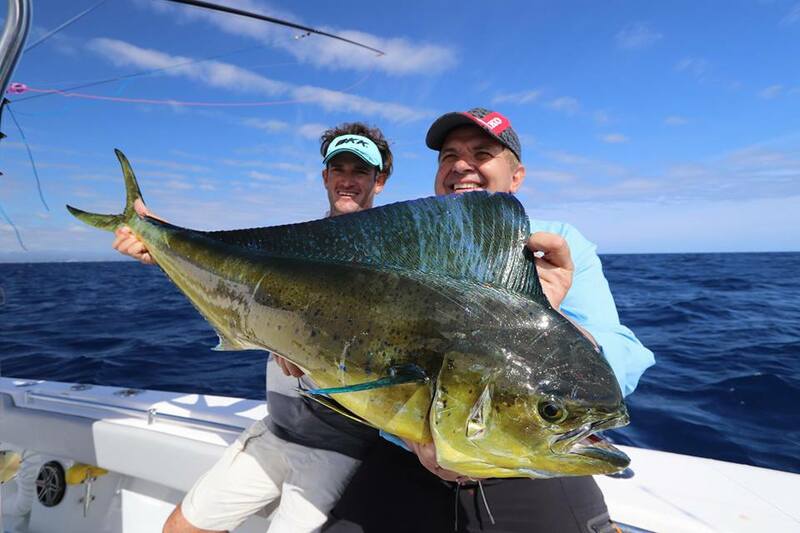 The Highlight at the moment would be the Surface action happening in the Broken River, with fisho’s having up to 20 hits off the surface in a session, most fish are around the 35cm, but the occasional 80cm horse has been spotted. Changing to a 4D Chatterbait will also get you some nice Yellowbelly. The Main Eastern Channel is fishing really well, anywhere from the Invergorden way to Euroa/Shepparton Road for Cod up to 60cm, mainly on Cheese and Bardi Grubs and from Dargalong Road to the Goulburn Weir behind Wahring Station fisho’s are catching Yellowbelly, Redfin and Cod on Jackal T/N 60’s and smaller Spinnerbaits. On the Lake front, haven’t had many reports, but the Kialla Lakes are still fishing OK for Yellowbelly on small Vibes and Jackal T/N 60’s. The Waranga Basin and surrounding Channels are still fishing well for Redfin on pretty much any lure with Red on it, small Deep Divers and Ice Jigs for the Basin and Hogbacks for the channels your best bet, most Redfin are small, but patience and changing locations to find the bigger fish will get you a good feed. Small Yabbies and Worms working well also. Austin Laurie and a few other young fella’s from Rochester are still catching some nice Yellowbelly and Cod on Spinnerbaits in the Campaspe River. A few bigger Redfin being caught at Greens Lake at Corop, mainly on small Yabbies and over near the Inlet Channel on the other side of the lake, but beware of ski boat traffic. 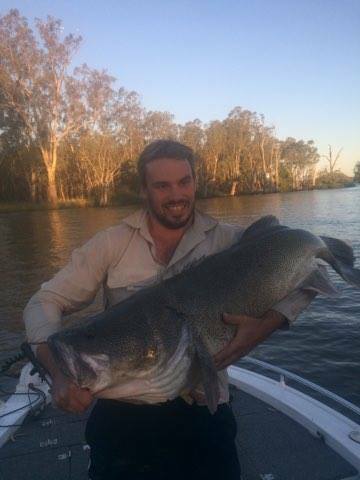 Austin Laurie from Rochester fished the Gunbower Region during the week catching plenty of Cod on Worms, Shrimp and Cheese ranging from 40cm to 55cm. 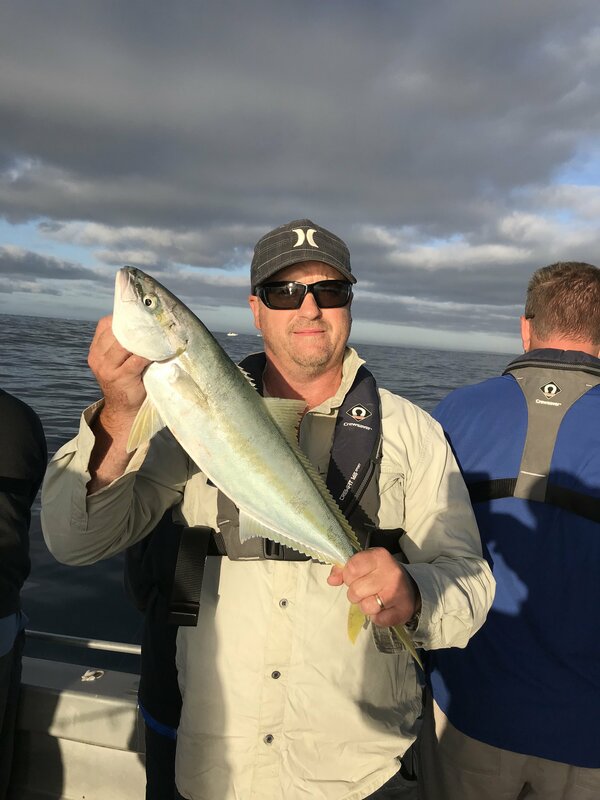 Plenty of Cod in the Berri area also, Surface Lures such as Koolabung Codcrackers and Jackal Pomperdores and Bassman Mumblers and 4 X 4 Spinnerbaits working well also. After missing 5 nice Cod one morning, Mark Gibson (pic) finished his day with an awesome 117cm Cod, all fish where on Bassman Spinnerbaits, Codman Series, great start for Marks season, I’m sure he will feature in the reports in the future. Lake Mulwala is fishing well also, plenty fish big Cod caught and lost, pretty much all techniques are working well from casting Spinnerbaits and Mumblers, Big Plastics, Jackal Swimbaits and of course Big Surface lures all working well. I just wanted to thank-you for all the reports you have done , they take time – they are always very detailed & with allot of information , and as I am an avid freshwater angler, enjoy reading them each week . keep up the good work ! and well done . Just about to go fishing and thought I would have a quick look at the on line fishing reports. This is the first time I have read Trelly’s report and I couldn’t believe how informative and up to date your reports are. Great work!